It is the topic no Hollywood film maker would touch with a ten foot pole. It is the topic no abortion advocate will discuss let alone admit. It is the topic many pro-lifers do not even know exists: survivors of failed abortions. It is the topic that Jon and Andy Erwin chose for their first feature film. October Baby is the moving story of nineteen-year-old college freshmen named Hannah. Hannah has battled health issues her entire life and after collapsing onstage during her theatrical debut she wants answers to her ongoing health problems. Her father, a doctor, has a co-worker examine Hannah and do a complete medical work up looking for solutions. The result brings them to a conclusion that will quite literally, rock Hannah’s world. Doctors can keep treating her symptoms but her physical and emotional issues likely stem from one source: her difficult birth. Hannah recalls vaguely the numerous surgeries to correct hip issues as a small child. She has battled asthma her entire life but now her emotional health issues are coming to surface as well. Why does she feel so alone? Why does she struggle with feeling unwanted when she has two loving parents? Why does she struggle with self worth? In the doctor’s office with her parents she finally learns why. Hannah’s difficult birth was actually a failed abortion. When her birth mother came back to finish the botched procedure she was in labor and so the nurse at the women’s clinic drove her to the hospital where she gave birth to Hannah. The birth mother abandoned Hannah and a medical school student doctor ended up becoming her adoptive father. Hannah’s parents never told her she was adopted, never told her that her birth mother actually tried to kill her, never told her that her health issues were the direct result of the procedure meant to end her life. So begins Hannah’s journey to find the entire truth, a journey that impacts everyone who knows her just as abortion impacts all of us — missing friends, spouse, children, siblings, co-workers whose lives were snuffed out long before they were visible to us. In this, their first feature film, the Erwin brothers do a great job of interweaving the threads of many lives and showing the impact that just one life can have. Over 55 million people have been killed through surgical abortion since 1973, hundreds of millions more through chemical abortions and abortifacient contraceptives. The silence of the missing is deafening. This movie is unique in that is addresses the many facets of the abortion issue. The single woman desiring a college education and a career who seeks the abortion because she feels she has no other choice; the young doctor trying to pay for and finish medical school faced with an abandoned baby in serious need — will he and his wife be the ones to step up and love this precious gift; those who work at abortion clinics and have bought the lie that the unborn child is not a person and that they are doing the world a service by providing “safe” abortions (as the women’s clinic nurse said when she first saw Hannah, “I didn’t see no tissue, I just saw the face of a child.”); the police officer called to deal with issues at the abortion clinic; that post-abortive mother, years later, faced (literally) with her choice. October Baby, for all the seriousness of the topic, is actually all about hope. Where there is life, there IS hope. There is healing, there is forgiveness, there is redemption. The theme for the movie is, “Every Life is Beautiful” and we see that through the eyes of Hannah as we follow her on her life-changing quest for the truth surrounding her birth. The Erwin brothers made a concerted effort to reach the Catholic community as well. One scene between Hannah and a priest in a beautiful cathedral is a nice gesture to the fact that the Catholic Church has been leading the fight for the unborn for decades. The film makers echo clearly our own Mother Teresa’s words, “Every life is precious to God, whatever the circumstances.” Hannah’s journey leads her to this eternal truth. She is loved, she is wanted, and she is precious. 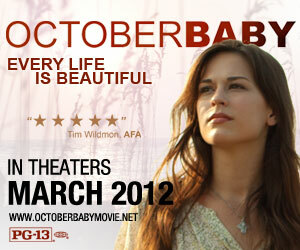 Gianna Jessen, an abortion survivor herself, loved this movie. The Erwin brothers were inspired with the idea for the movie after hearing Gianna speak. As a Christian singer she recorded the song, Ocean Floor, which is used in the movie. Gianna and the character of Hannah do a powerful service to the pro-life movement: they put a face on abortion. If I was just a blob of non-viable tissue, how could I be standing here? Their very presence witnesses to the dignity of every human life. While certainly a tear jerker this movie has a great sense of humor! From having Chris Sligh (of American Idol fame, now a Christian recording artist) as the misfit chaperone for Hannah’s road trip with her college friends to having Javier (of Courageous) as the forgiving police officer about to impound their road trip VW van, to Hannah asserting that she really does have a wild side because, “You have seen me play Scrabble…don’t tell me I am not wild.” There are enough laughs to lighten the message and bring it home powerfully. October Baby is rated PG-13, I would recommend this movie for high school age and up (possibly mature middle school age). There is no drinking (one reference to it), no swearing, no kissing and the film makers go out of their way to show the college kids on their spring break have gender-separate hotel rooms! This is a sweet story with a life-altering message. Those considering abortion, those who have had abortions, those who feel abortion is a woman’s right, and those who do not wish to face the reality of abortion will be challenged to the core. The Erwin brothers are sensitive to the post abortive parent while calling out those who would sit on the fence not wanting to make waves. And that bit about Lepanto in the title? Well, just guess when Hannah was born…..October 7th. The film makers are not Catholic and may not have known the significance of that date to faithful Catholics, but we sure know who our big gun is in a spiritual battle. With Our Lady of Guadalupe on deck and the faithful of Christendom abiding Pope St. Pius’ command for the Rosary to be said for victory over evil, it took one more thing to tip the scales in this famous battle. The Christian slaves who were forced to row the Turkish ships rebelled and, several thousand strong, stood up to their oppressors, turning the tide of the battle and helping to save all of Europe from Muslim invasion. When those who have been enslaved to the abortion agenda rise up against the evil that has oppressed them, the tide will begin to turn. Look no further than Abby Johnson. Promote the movie in Facebook/Twitter as well – post the movie trailer! Ask your Knights of Columbus to buy a block of tickets for opening weekend (they can give them out for free or resell to parishioners after Mass). Get a bulletin spot into your parish bulletin (way ahead) so people can plan to attend. Encourage various ministries to support this movie opening weekend (scripture studies, high school youth groups, women’s prayer groups). Get the information into your pastor’s hands and see if he will encourage people to attend.